Applications are invited from the intending candidates for filling up the following vacant posts in the Amalgamated Establishment of the Deputy Commissioner, and Sub-Divisional Officers (C) as District Election Officer. Must have completed Bachelor Degree from any recognized University/Institute. A) He must have good working knowledge of office productivity software tools (independent) of any operating System, i.e. MS Windows, Linux, Mac etc. such as, I) Word Processor, II) Spreadsheet, III) Presentation graphics, IV) Concept of Database, V) Internet VI) e-mail. B) he must possess minimum 6 (Six) months Diploma in Computer application/ knowledge from an institute recognized by the Government. 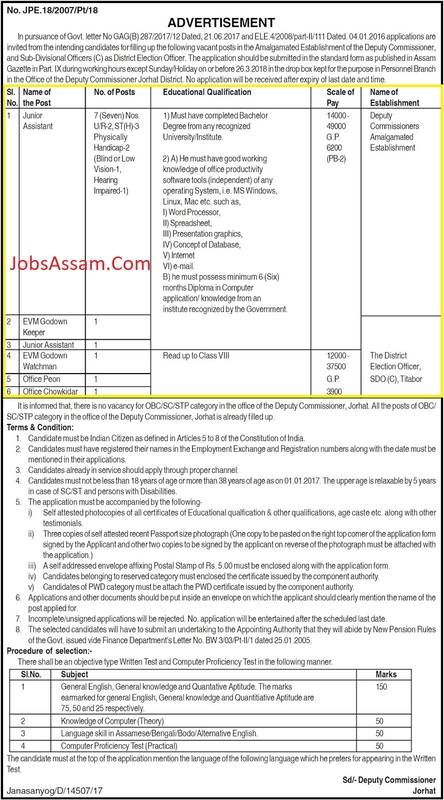 Note: It is informed that, there is no vacancy for OBC/SC/STP category in the office of the Deputy Commissioner, Jorhat. All the posts of OBC/ SC/STP category in the office of the Deputy Commissioner, Jorhat is already filled up. Age: Candidates must not be less than 18 years of age or more than 38 years of age as on 01.01.2017. The upper age is relaxable by 5 years in case of SC/ST and persons with Disabilities. The application should be submitted in the standard form as published in Assam Gazette in Part. IX during working hours except Sunday/Holiday on or before 26.3.2018 in the drop box kept for the purpose in Personnel Branch in the Office of the Deputy Commissioner Jorhat District. Applications and other documents should be put inside an envelope on which the applicant should clearly mention the name of the post applied for. A self addressed envelope affixing Postal Stamp of Rs. 5.00 must be enclosed along with the application form.